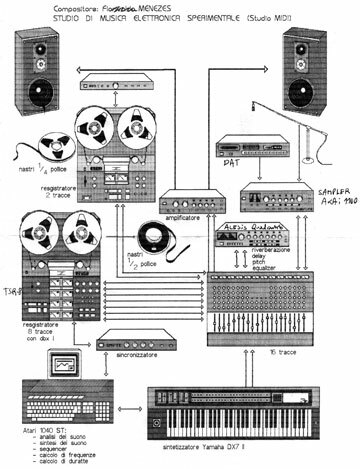 The Studio PANaroma of Electroacoustic Music was founded by the Composer Flo Menezes in July 1994, originally as a cooperation between the State University of São Paulo (Unesp) and the private faculty FASM. 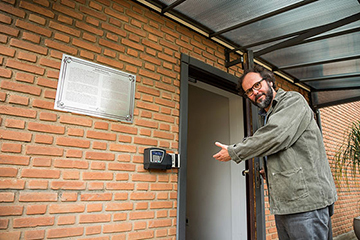 After the end of this cooperation in June 2001 the Studio PANaroma became an autonomous institute of Unesp. In 2004 a new building was inaugurated with a total area of 170 m2, and in 2008 the Studio PANaroma moves to its definitive building of about 300 m2, consisting of various electronic studios, an octophonic sound system based on Genelec loudspeakers, on ProTools systems and KYMA. PANaroma was already the name of the private studio of Flo Menezes when he lived in Italy in 1991 near Bologna (see Figure below). At that time, Flo Menezes was a guest composer at the Centro di Sonologia Computazionale at the Padua University, after having spent some years as guest composer at the Studio für elektronische Musik of Cologne (from 1986 to 1990). Although this name seems to have its origin in the tupi language, the word “panaroma” was actually invented by James Joyce in his seminal work Finnegans Wake, a symbol of complexity, referentiality, elaboration, experimentalism and avant-garde not only for the literature, but also for the arts in general. It means “multiple aroma”, “aromatic panorama”. The term became evident in Brazil with the translation of fragments of Joyce’s work by the inventors of concrete poetry in São Paulo, Augusto de Campos and Haroldo de Campos: Panaroma do Finnegans Wake. Choosing this word as the name of the studio, Flo Menezes intended to give a special character for his initiative as a pioneer work in the academic field in Brazil, revealing its international aim if compared with the most significant studios of this genre around the world. The Studio PANaroma has the most significant archives of electroacoustic music in Brazil, consisting of the works inscribed at the editions of CIMESP (see below), the pieces realized at the Studio PANaroma and digital recording of many historical works of this genre. Many of the pieces, which were realized at the Studio PANaroma, were awarded international prizes of electroacoustic music, as for instance in Bourges, Musica Nova, Luigi Russolo, Ars Electronica and other international contests around the world. The Studio PANaroma organizes periodically distinct series of concerts and became therefore the most important institution in Brazil for the diffusion of the international electroacoustic music. Just until the end of 2001, for example, more than 50 concerts were organized by the Studio PANaroma. Besides these concerts, the Studio PANaroma takes part on international projects and interchanges. Every two years since 1995 the studio organizes the International Contest for Electroacoustic Music of São Paulo (Concurso Internacional de Música Eletroacústica de São Paulo – CIMESP), the most important contest of this genre in all the Americas. Acousmatic pieces as well as mixed works can be sent to the editions of the CIMESP. Every two years since 1996 the Studio PANaroma organizes the International Biennial for Electroacoustic Music of São Paulo (Bienal Internacional de Música Eletroacústica de São Paulo – BIMESP). In general each BIMESP lasts one week with about 50 pieces, mostly acousmatic, but also mixed works with electroacoustic sounds and/or live-electronics. Its concerts are traditionally structured on Panel-concerts of the countries, of a given personage, of the interaction, a historical panel and a panel with recent works of the Studio PANaroma itself. From 1996 on, Flo Menezes conceived the recording series "Maximal Music", which has nowadays also DVDs. Its beautiful design is constituted by the reproduction of works by the most representative Brazilian artists of our days, divulging the contemporary arts of Brazil. Besides this series there are many other productions of contemporary recordings that are realized at the Studio PANaroma. This is the most important activity of Studio PANaroma: the realization of new electroacoustic compositions, which are conceived and realized by the students as well as by guest composers. The Studio PANaroma is not restricted to the classes of electroacoustic music theory and composition. Many notorious composers were already visitors of the Studio PANaroma, giving lectures, interviews and workshops: Pierre Boulez (France), Hans Humpert (Germany), Léo Küpper (Belgium), Hans Tutschku (Germany), Christian Calon and Gilles Gobeil (Canada), and many others. Important musicologists, musicians and composers visited the Studio PANaroma in the last years: Mikhail Malt, Dieter Schnebel, Claude Hellfer, Jean-Yves Bosseur, Ralph Paland, etc. In 1998 Flo Menezes gave a special course about the works of Karlheinz Stockhausen, who invited Flo Menezes to become professor of analysis in the international Stockhausen-Kurse in Kürten, Germany, in 1999 and 2001. Besides the undergraduate courses, the Studio PANaroma supports researches in the field of contemporary musicology and composition for post-graduate students. Supported by the FAPESP (a governmental institute for the support of research), the Studio PANaroma has modern resources consisting of many ProTools systems, Macintosh computers, the KYMA workstation, MOTU interface, digital recorders, octophonic, quadraphonic and stereophonic sound systems with Genelec and Mackie monitors, softwares as Fórum-IRCAM and GRM-Tools, and the PUTS: PANaroma/Unesp – Teatro Sonoro, the modern loudspeaker sound diffusion system which were founded by Flo Menezes in 2002. The Studio PANaroma is the most modern studio of its genre in South America. The Studio PANaroma de Música Eletroacústica da Unesp was the first one in Brazil to take part on the Forum-IRCAM (since 1995). Besides that, the Studio PANaroma takes part on many international interchanges and cooperations with other significant institutions around the world (Studio für elektronische Musik of Cologne, Germany; GRM (Groupe de Recherches Musicales) of Paris; Musikwissenschaftliches Institut of the University of Cologne, Germany; Universidade Lanús of Buenos Aires, Argentine; Musiques & Recherches of Ohain, Belgium; BEAST - Birmingham Electro-Acoustic Sound Theatre, U.K.; among others).